In the mid-1970s,Chris and I together purchased an old violin for $40 from a widow whose husband had attempted to repair them as a hobby. Knowing absolutely nothing about violins, we simply chose the most intact-looking one from those strewn about her attic. A repair guy who looked it over a week later judged that it had been made by immigrant German-Americans luthiers in the area, at a time when such inexpensive instruments as this were churned out by the hundreds, a cheap commodity item for sale to student and amatuer players. He estimated it then to be around 100 to 150 years old; i.e. pre-Civil War. And he grimaced patronizingly when pronouncing the paltry purchase price "about right". 30 years later, Ralph Rabin (a very knowledgeable Madison violin repairer) concurred. He stated that a) the instrument could never be made to sound any better than average, and b) to make the attempt would cost more than it was worth. In Ralph's words, the best use of the antique was to hang it on the wall for decoration. And indeed, as my musical expectations (and ear)slowly grew more discerning, the fiddle was sounding worse and worse. Eventually it sat gathering dust, the would-be repair money spent on a new, inexpensive-but-better Chinese-made instrument. It turned out however that there were physical causes behind the steadily-worsening sound quality of the old instrument. When it finally became unplayable some years ago, James offered to repair it. Here's the story of what he discovered, and what he did about it. Jim, understating: "I have successfully removed the back plate and button and I found some interesting things." 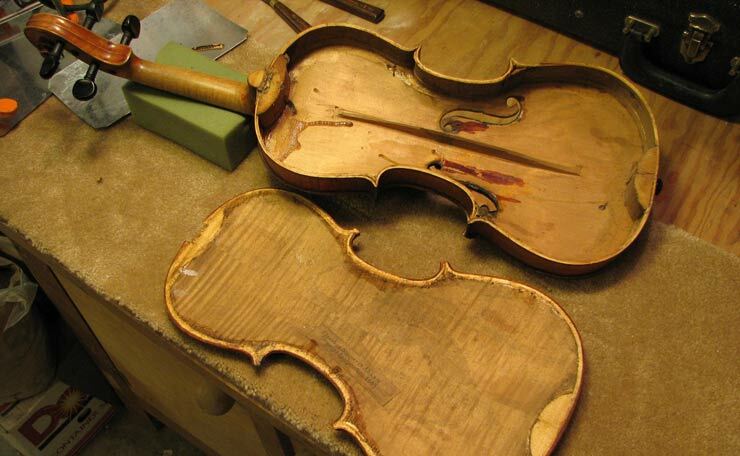 "I ordered a beginner's book on violin construction and repair. Its basic enough that it probably won't cover these things, but it should give me a better idea how the wee-beastie is made. If you know anyone who knows how to really repair these things, run this [plan] by him or her...."